American author Edna Ferber wrote popular fiction and collaborated on several successful Broadway plays. Born in Kalamazoo, Mich., Edna Ferber at an early age moved with her family to Appleton, Wis., where she spent most of her childhood. When her father lost his vision, she was forced to forsake her acting ambitions and, at the age of 17, began full-time work as a reporter for the Appleton Daily Crescent. Shortly afterward she joined the staff of the Milwaukee Journal and later the Chicago Tribune. During this period she wrote several short stories, some of which were published in Everybody's Magazine. She discarded a novel which her mother salvaged and had published in 1911 as Dawn O'Hara. Two short-story collections followed, Buttered Side Down (1912) and Roast Beef Medium (1913), and the novels Fanny Herself (1917), The Girls (1921), and Gigolo (1922). Ferber won her first popular success with the novel So Big, the story of a young widow on a truck farm in Illinois who sacrifices everything for her son's happiness. She was awarded the Pulitzer Prize for it in 1924. Show Boat (1926), perhaps her best novel, tells the story of a showboat performer's love for an unscrupulous gambler. The novel was adapted as a successful Broadway musical the following year. Cimarron, another best seller, dealt with the spectacular Oklahoma land rush of 1889. In the early 1920s Ferber began a fruitful collaboration with playwright George S. Kaufman, producing such plays as Minick (1924), The Royal Family (1927), Dinner at Eight (1932), and Stage Door (1936). In her later novels Ferber continued to explore various geographical and historical settings. American Beauty (1931) describes Polish immigrants in Connecticut; Come and Get It (1935) is about Wisconsin lumbermen; and Great Son (1945) depicts four generations of a Seattle family. Many of Ferber's novels have been made into movies, including Saratoga Trunk (1941), which is set in New Orleans and Saratoga Springs, N.Y., and deals with the founding of railroad dynasties; Giant (1950), a story of oil fortunes in contemporary Texas; and Ice Palace (1958), about Alaska, from exploration to the fight for statehood. Ferber published her first autobiography, A Peculiar Treasure, in 1939 and her second, A Kind of Magic, in 1963. Her often energetic and pleasantly nostalgic work was immensely popular with both the reading public and movie-and playgoers, making her one of America's best-known authors. She died on April 16, 1968, in New York City. Miss Ferber's fiction is reviewed in Robert Van Gelder, Writers and Writing (1946), and W. Tasker Witham, Panorama of American Literature (1947). 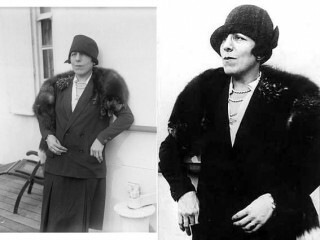 View the full website biography of Edna Ferber.